Being an Amazon Prime member I order from them quite often. Many times the purchase that I make includes a free MP3 or other type of credit. This is all well and good, but in most cases there is an expiration date on the use of the credits and Amazon makes it damn near impossible to find your credit balance. 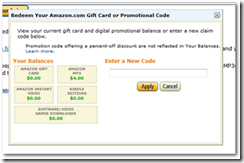 Go to the “Gift Card Center for Amazon MP3”, like you are going to redeem a credit, then simply press the ENTER YOUR CODE button. You will see both a form to enter a new code, and your current credit balances, like the example below.